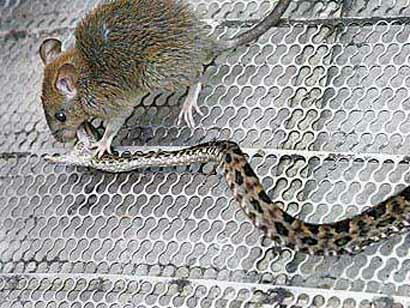 Tiny mouse kills snake: "Firefighters in Taiwan caught a 35cm snake and put it into a cage for safe-keeping. They found a tiny mouse and threw him into the cage as food for the snake but what happened next was hard to believe. The tiny mouse became so aggressive when he saw the snake in the cage that he started to attack it, bite it and scratch it continuously. After a vicious 30 minute battle, the snake was dead and the mouse was left with hardly a scratch."